Those awaiting results of September 2015 Mechanical Engineer (ME) and Certified Plant Mechanics (CPM) board exam can find here the complete list of passers, top 10 (topnotchers), top performing school and performance of schools as the Professional Regulation Commission (PRC) and the Board of Mechanical Engineering released results in 7 working days after the last day of exam. PRC on Friday night announced that 2,136 out of 3,866 passed the Mechanical Engineer Licensure Examination and 24 out of 51 passed the Certified Plant Mechanic Licensure Examination. The Mechanical Engineering board exams were conducted on Tuesday and Wednesday, September 29-30, 2015 in the cities of Manila, Cebu, Davao, Iloilo and Lucena. ME board exam covers the following subjects: industrial and power plant engineering, mathematics, engineering economics, basic engineering sciences, machine design, materials and shop practice. The licensure exam for CPM covers the following major subjects: elements of power plant machinery, shop machinery practice and elements of industrial plant machinery. In October last year, results were announced in just 2 working days after the last day of exam. 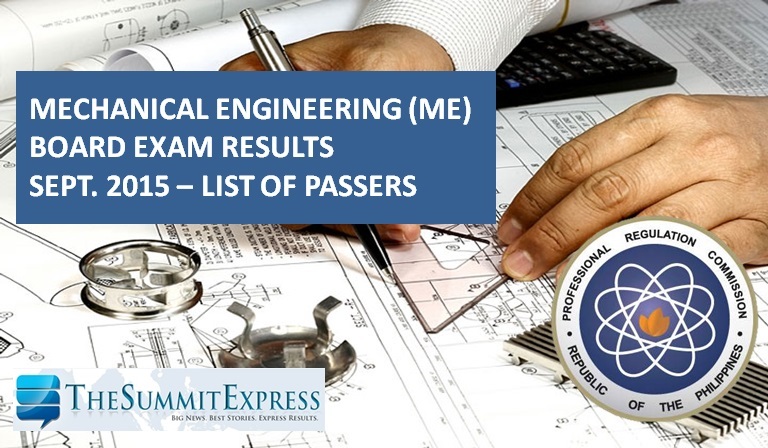 A total of 2,960 out of 3,841 passed the Mechanical Engineer Licensure Examination and 32 out of 59 passed the Certified Plant Mechanic Licensure Examination. In March 2015, results of ME board were released after 3 working days. PRC said that 739 out of 1,247 hurdled the ME board exam and 19 out of 28 passed the CPM exams. MANILA, Philippines – It was a sweet sweep in the 2nd round for Gilas Pilipinas. But Coach Tab Baldwin and his boys are not in the mood to celebrate their 5th straight win versus India yesterday. They will only be jubilant if they book the ticket to Rio Summer Olympics 2016. Before that, the national squad must finish all of their assignments and it starts tomorrow, at the knockout quarterfinals round against Team Lebanon. Lebanon is the fourth team in their bracket and the last crew to book the last ticket to the knockout stage after beating Team Jordan yesterday. With the win, they will face the hot streaking Gilas Pilipinas in the win or go home crossover quarter finals. Beating Iran is really a huge thing for Gilas boys. With that win, they positioned themselves on the top spot of their group and gave them the lightest opponent from the other division headed by the host country China. Lebanon might be the lightest but that doesn’t mean an automatic nor an easy win for Coach Baldwin and his gang. Philippines has already faced Lebanon plenty of times in international competitions, and Lebanon was not easy to play against. Led by Fadi El Khatib, the Lebanese team is always a tough nut to crack and almost as hard as other Middle Eastern squads like Qatar and Jordan whom our boys have also faced in the past. Lebanon Head Coach Vaselin Matic bravely told the media that his team is clearly the underdog in this game. Aside from the subpar performance of his team that resulted into last place in their group, Coach Matic and his boys are playing without their star player and FIBA veteran Fadi El Khatib who begged off at the last minute due to existing playing contract overseas. Coach Matic thanked heavens after knowing that Philippines topped its bracket and will be playing against them. He preferred to face the Filipinos rather than their Middle Eastern neighbor and defending champions, team Iran. Many Filipino basketball experts like Gilas’ match-up against Lebanon instead of Jordan. But why? Gilas 1.0 and former PBA Head Coach Rajko Toroman spearheads the Jordanian team. Toroman has the idea on all Gilas cagers ‘ playing style for staying in our country for almost half-a-decade. For sure, he has already prepared a game plan on how to counter the Filipinos in anticipation of their possible meeting. But unfortunately, Coach Toroman and his wards fell short against Lebanon. Philippines’ only loss to Palestine on day one of the tournament became a blessing in disguise according to the oldest player in entire Asia, Asi Taulava. With the fiasco, they learned how to protect their lead, worked hard and above of all, respect their opponents which heavily manifested in their last five games where they managed to cover their big margins and held their grounds until the final buzzer sounds. 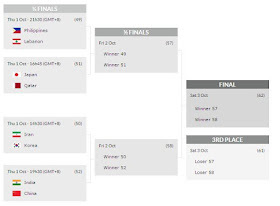 Philippines’ path to the finals is the “easiest”. If we’ll look at the other bracket, we can say that we’re in good hands. All we have to do is to work hard and never get over-confident. Should Gilas overcomes Lebanon, they will face either Japan or Qatar in the semis unlike the other group where Iran and China are both expected to dominate their quarterfinal rivals and will advance to the semis. Their semifinals match would be the hardest pill to swallow because both Iran and China are considered as the Titans of Asian Basketball. But only one of them will advance to the finals. It is not impossible for Gilas to win the lone Asian ticket to Rio Summer Olympics, they have all the tools to win their remaining games especially having a legit bigman – Andray Blatche who can match-up against Asian giants like Hammed Haddadi of Iran and Yi Jian Lian of China. This is the first time that Asian teams have faced Andray Blatche. 2 years ago, during the FIBA Asia World Cup Qualifiers held in Manila, Philippines’ reinforcement was Marcus Douthit. Blatche only joined the team at the World Cup in Spain but Team Pilipinas wasn’t able to face any Asian team. Familiarity with Asian Bigs is the edge of Andray. During an interview after the Iran game, Blatche cited that he has already faced Haddadi in the NBA and even in CBA (Chinese Basketball Association) many times and that’s why he really knows how to play against the 7’2 Iranian. If ever Philippines play against China in the finals, it won’t be too hard for our Naturalized player to face his counterparts for he has been in the Chinese League for couple of years now. But it will still be tight because China has 4 legit 7-footers against Philippines’ front court muscles: 6’11 Andray Blatche and 6’10 - 42 years old Asi Taulava. Should the Philippines fall short in the finals, they will clearly miss the golden Olympic ticket but will still have a chance to get one via another FIBA Olympic Qualifier. This time, it will be tougher than the Asian version. Runners-up from FIBA Americas, Africa and Europe will be trying their luck for 2 more tickets to Rio 2016, the likes of: Argentina, Canada, Mexico, Lithuania, Serbia, Czech Republic, Angola, Tunisia and Senegal which all have NBA veterans playing for their flag. In this case, Gilas Pilipinas must win the finals or else, they will take the high roads to Rio which is perilous. The odds of winning the Asian tournament is highly possible. Philippines is the only team playing with its all heart out despite of the height difference compared to the rest of the Asian nations. And after slaying the Giant Iran, Philippines is the team to beat. Everyone wants to get a piece of Gilas. Two things that Gilas needs in order to win the gold: Don’t take any game lightly and protect the margin at any cost. 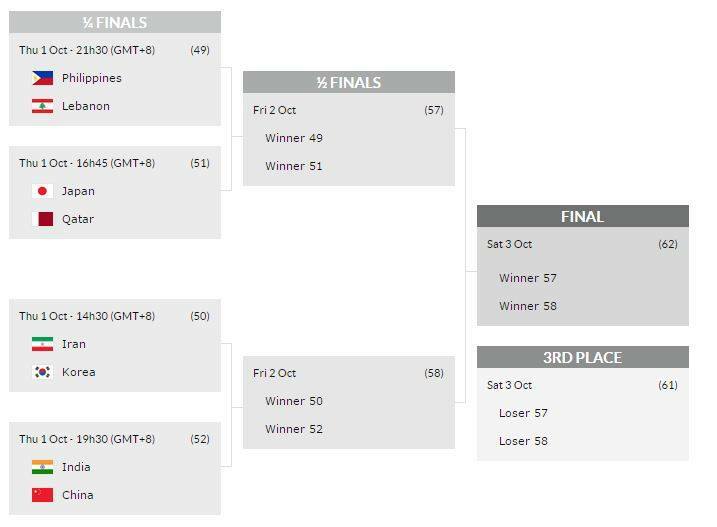 The quarter finals starts tomorrow, October 1, 2015 where Gilas Pilipinas faces Lebanon at 9:30pm. The game will be aired live by Sports 5 on free TV and via BTV on Cable TV.